All LogMeIn users beware. 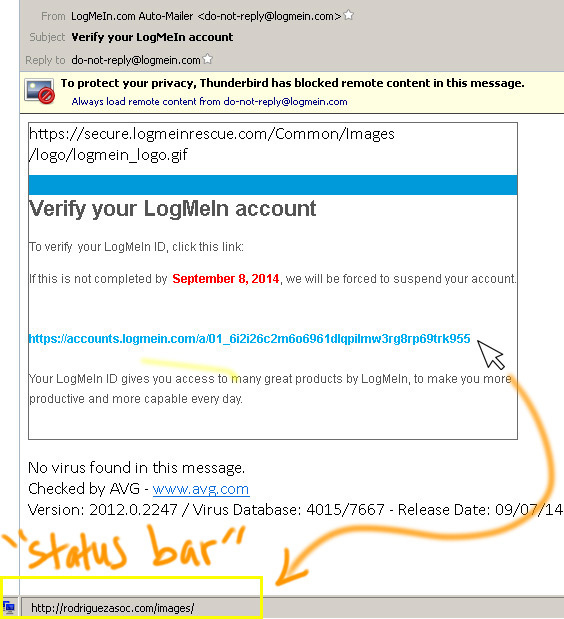 New phishing attempt trying to get people to "Verify LogMeIn account" via email. Of course, most experienced tech users will have their "Status Bar" turned on - the most important and common method of verifying a links validity prior to click clicking on it. Simply hold your mouse pointer over the link ant it shows you the actual link location at the bottom. If you do NOT have your status bar turned on in any email client or web-browser, it's the single most important advice I can give as a tech user. KNOW WHERE YOU'RE GOING. Search... "How to turn on status bar for [email client]"
Search... "How to turn on status bar for [web browser]"
Usually you can turn the status bar on within just a few clicks and it usually stays on for Good. Hosted by HostNine This page was created in 0.00682902336121 seconds.